I love roasting just about anything, and the glaze sounds perfect (and simple, too). Thanks for the post, and Happy Thanksgiving to you, too! Fabulous, Lisa, and you'd even get me eating turnips cooked and served this way. I'll have to try this. Great recipe. I hardly roast any veggies, except potatoes and carrots...I love the maple balsamic glaze, sounds and looks really great! 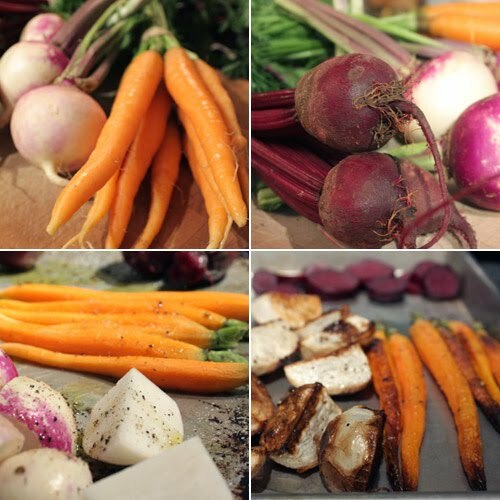 One of the best ways to roast veggies! Beautiful veggies!! Believe it or not, I've never eaten a turnip. My parents always ate turnip greens but I never touched those either. I love roasting vegetables, so maybe next time I'll try some turnips! Beautiful! I agree that a big dinner like Thanksgiving needs at least one simply prepared vegetable to contrast with all the fussy dishes and highlight how great vegetables can be. It is fun to piece together menus for dinner. Roasted veggies belong on everyone's menu for Thanksgiving! A perfectly delicious way to prepare the vegetables! 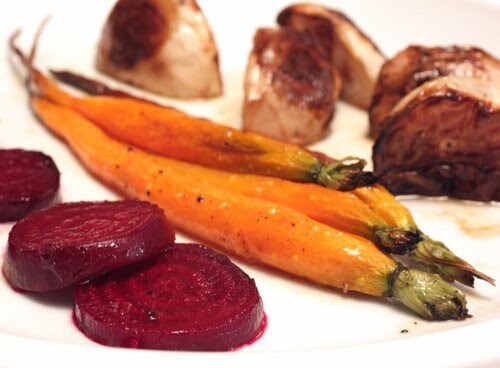 balsamic is just perfect for roastted veggies! these looks so colorful! Those veggies look so delicious! Perfect! Thanks for stopping my my site and the sweet comment! I love roasted veggies, these look like perfection. lovely. 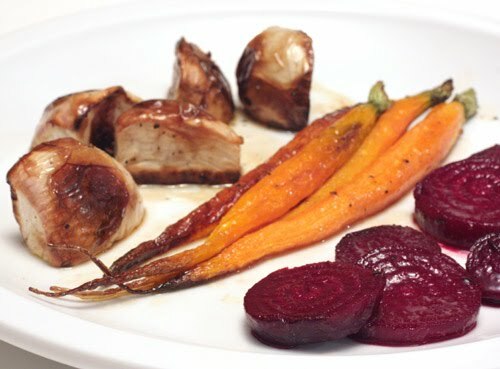 I roast veggies a lot and usually use honey with Balsamico, but will definitely try with maple syrup. And again, fabulous photos. I love roasting root veggies! So much flavor that way! I can even get away with throwing some turnips and parsnips in there- veggies we really don't like much on their own. I have often wanted to take a photo of roasted vegetables, but have thought "they are not as pretty as their fresh cleaned counterparts", but you have show us true beauty here, and not to mention the flavor just rocks! I normally have my veg this way! Roasted veg has so much flavour! and I normally drizzle balsamic glaze on it too. Yum!! Love roasted vegetable with glaze. Happy thanksgiving! I roast vegies regularly and often use balsamic vinegar. But I never thought of using maple syrup! Will do that next time-THANKS. I don't do turnips, but replace them with parsnips and often add asparagus and little pearl onions (easy when you use the frozen ones). Brussel sprouts are amazingly good roasted, but I don't use the vinegar with those. roasting vegetable is a very healthy way of cooking!! love this recipe!! i must try this for dinner!! thanx! Happy Thanksgiving Lisa! I hope it is a wonderful meal for you. Lovely combination of colors and the glazed. Happy Thanksgiving ! I love roasted vegetables & I also roasted them with maple syrup on them!! I will surely use this balsamic maple glaze!!! What gorgeous veggies! Happy Thanksgiving! I'm like you and would love to host next year (I've actually haven't done it yet!). I love using a balsamic vinegar glaze - one of my favorites is over fennel. i love balsamic glazed veggies! Those look fabulous. We don't celebrate Thanksgiving here in Holland, but I am already planning what to do for christmas dinner and actually looking for some veggie dish to add to the main course and this just might be perfect! I must try this maple balsamic glaze. A healthy yet delicious way to eat more greens!